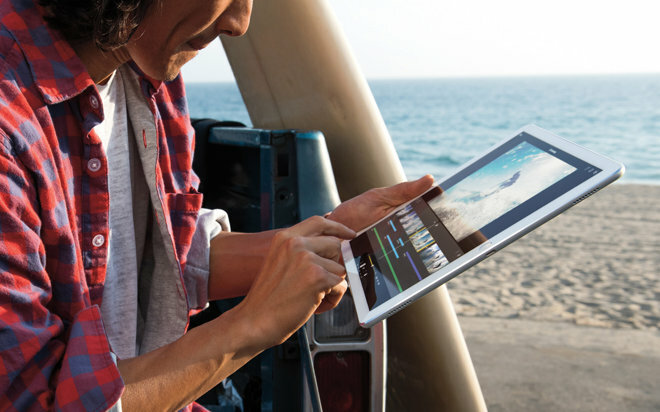 The iPad Pro uses a new storage controller that improves read and write speeds, with performance more comparable to desktop PCs, according to marketing on Apple's website. The controller was specifically chosen to match the speeds of the tablet's new A9X processor, Apple notes in the Technology section of the Pro's webpage. The company isn't offering any more details, such as whether or not the part was custom-designed. Apple does claim that its memory architecture lets people "quickly open even in the largest files," such as RAW photos or 4K videos. In demonstrations on Wednesday, the company showed the Pro editing three 4K sources simultaneously, something laptops often struggle with. Much of Apple's marketing for the tablet has involved comparing it to desktop and laptop computers. It claims for example that the A9X is 1.5 times faster than a similar desktop processor, and that any task possible on a PC should be possible on the Pro as well. The product is also believed to have 4 gigabytes of RAM. While many computers now have 8 or 16 gigabytes, 4 is still the same amount in base configurations of the MacBook Air, and twice the memory present in the iPad Air 2. The Pro is due to ship sometime in November. A $799 model will include just 32 gigabytes of storage, but higher-end options will have 128 gigabytes.